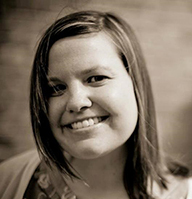 Sara is the Project Director at Project Everlast Omaha and has been with Nebraska Children since November 2014. Sara works with initiatives related to Project Everlast employment and education programs. Prior to joining Project Everlast, Sara managed aftercare and independent living services for the Eastern Service Area at Nebraska Families Collaborative. Sara’s previous experience includes over 12 years of work in the areas of behavioral health, substance abuse prevention and education, child welfare services and nonprofit management in Omaha and Lincoln. Sara is a Licensed Mental Health Practitioner (LMHP) in the state of Nebraska and previously provided outpatient behavioral health services to children and families. Sara is also a certified trainer in the following areas: trauma-informed care, motivational interviewing and 40 Developmental Assets. Sara is a graduate of Creighton University with degrees in Psychology and Communication. She holds a master’s degree in Human Services & Counseling and a Masters of Public Administration degree from Bellevue University. Sara lives in Omaha with her husband, Blair, and a spoiled labradoodle named Taxi.